Why is backup important ? WordPress Backups is the best way to protect your WordPress websites data. By having several copies of the data at periodic intervals, any destruction of data need not become a show-stopper. The simple solution would be restore the lost data from the backup. For this reason, it is important to do backups properly and on a regular basis, as soon as you start creating WordPress websites. What typical backup features do I need for my website ? Why is UpdraftPlus a good solution? The UpdraftPlus WordPress plugin is free and has is currently installed on 800K websites. It has all the necessary features you'll need to secure and backup your website like migration, automatic backup, ability to restore a backup, etc. The following video is a quick presentation of what this plugin can do for you. Installing the UpdraftPlus plugin is a breeze. From the WordPress admin dashboard, click on Plugins -> Add New. Enter the name of the plugin in the search box and click enter. Click against Install Now for installation. You will be prompted for activation. Activate the plugin after installation. 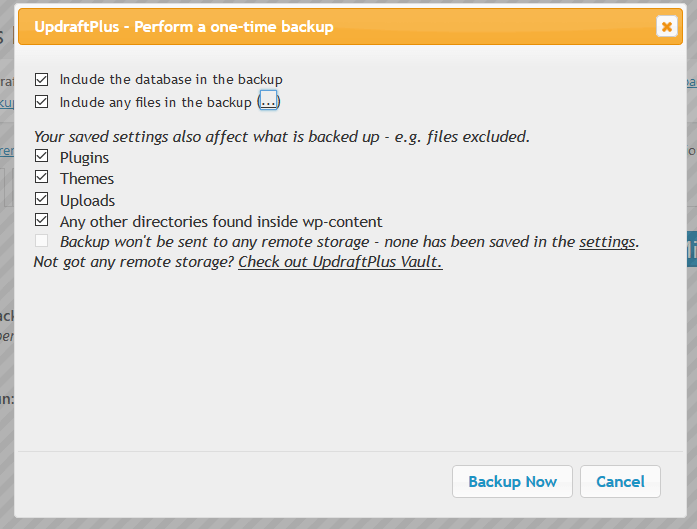 From the WordPress admin dashboard, click on Settings->UpdraftPlus Backups. From this screen, you can backup/restore/clone. Let us first set up some options. Click on the third tab Settings. For Files and the database, you can separately schedule the backups periodically or let it be the default manual backup. Choose the interval from the dropdown box. You can also specify how many backups you want to retain. Next, you can also choose a remote storage, preferably a cloud-based option for the backups to be stored. Though the default is local storage, it is not safe to store locally. Several options are available as shown below. Click on one of the options that suits you. Depending on the option, you will have to configure it by giving the credentials and other details. Finally, choose the files that you want to be included in the backups. Some of the files that are not modified regularly need not be backed up frequently. You can choose a complete back up for a different interval and a partial backup for a more frequent interval. Choose based on your needs and your storage space availability. Click on Save Changes and you are ready for backups. Click on the first tab, Current Status. Here, there are three buttons. You will find a screen like below if you have scheduled backups. Simply click on Backup Now for an immediate manual backup. This will be a backup made in addition to the scheduled ones. A pop-up box appears where you can configure the files required and/or database to be backed up for this one time. After choosing, click on Backup Now. The backup job starts and a progress screen is shown. After completion of the backup, take a look at the second tab, Existing backups. You will see an entry in the list of existing backups. The date, the data and the actions that can be performed are displayed. You can add more backups or wait for the scheduled backups to happen. After more backups, you will find a list of backups like below. You can click on View log to see the log details of the backup. When there is any data loss or damage, you can restore from a particular backup. From the Existing Backups screen, choose one or more of the data of a particular backup and click on Restore. A rectangular box appears above with the message that the file is ready. Click on Download to your computer. You will get a prompt to save the file. Alternately, you can also delete a particular backup from this rectangular box, by clicking on delete. This deletes the local storage version of this backup. You can also upload backup files using the Upload backup files link. 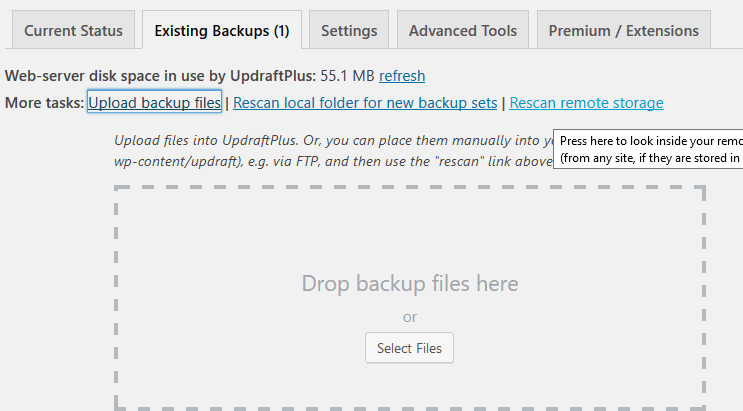 The backup and restore processes are as simple as that, when you use the UpdraftPlus plugin. There are some advanced options available in the premium version of the plugin, like the clone/migration. But, the basic version is sufficient for the basic requirement of data safety. Hope you will not postpone the backups anymore! Documentation created by: Menaka S.